The first round of the French Open Junior Championships was interrupted by rain early Sunday in Paris, but five US juniors advanced to the second round, with two others halfway through their matches when darkness caused postponement. Ulises Blanch was the most dominant, taking out Argentina's Franco Capalbo of Argentina 6-1, 6-1. Capalbo, No. 17 in the ITF Junior rankings, is the highest ranked player not to be seeded in Paris. No. 2 seed Taylor Fritz also had little trouble, needing less than an hour to get by wild card Gabriel Decamps of Brazil 6-1, 6-4. Nathan Ponwith, up 5-2 in the second set against qualifier Louis Wessels of Germany, saw that lead evaporate, but a late break gave him the set 7-5, after Wessels had won the first 6-3. The match was suspended for darkness after Ponwith took the second set. Michael Mmoh(6) and William Blumberg(9) had late matches that were cancelled midday when it was obvious that darkness would prevent the day's original schedule from being completed. The US girls to advance included Caroline Dolehide, who defeated Seone Mendez of Australian 6-4, 6-4, No. 7 seed Usue Arconada, who edged Emilie Francati of Denmark 6-3, 4-6, 6-3, and No. 3 seed Katerina Stewart, who cruised past wild card Lucie Wargnier of France 6-1, 6-2. Raveena Kingsley took the first set from top seed Marketa Vondrousova of the Czech Republic 7-5, but trailed 4-1 in the second set when play was suspended due to darkness. Michaela Gordon lost a heart-breaker to No. 8 seed Katie Swan of Great Britain, letting a match point and a 5-1 third set lead slip away in Swan's 4-6, 6-4, 8-6 victory. Although Gordon served for the set twice, it was on Swan's serve at 3-5, 30-40 that the match point surfaced, but the Australian Open girls finalist saved it and broke in the next game. Although Gordon did hold to continue the match, she lost her serve quickly at 6-7 to drop the match. Francesca Di Lorenzo lost to Evgeniya Levashova of Russia 6-4, 7-6(2), the only other US loss of the day. No. 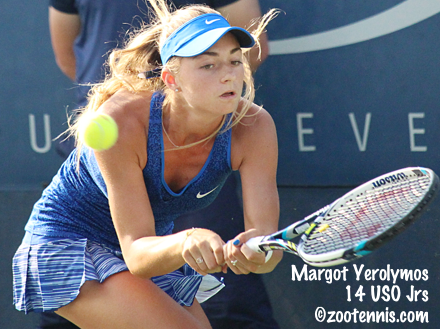 2 seed Shilin Xu led 5-2 in the third, but failed to convert a match point against Margot Yerolymos with the French wild card saving a match point at 3-5 and winning the final five games of the match in a 4-6, 6-2, 7-5 victory. Xu, who also lost in the first round of the Orange Bowl last year, has always played her best tennis on hard courts, not clay. So instead of Xu, Dolehide's opponent is Yerolymos, and their second round match, as well as three other girls second matches, are on the schedule for Monday. Although top seed Orlando Luz of Brazil, No. 3 seed Seong-chan Hong of Korea and No. 5 seed Viktor Durasovic of Norway were taken to three sets, the only boys seed to lose Sunday was No. 7 seed Akira Santillan of Japan, who lost to Alex Molcan of Slovakia 6-4, 3-6, 6-4. Xu was the only girls seed to fall Sunday. In addition to the completion of Ponwith's and Kingsley's matches, US juniors in first round action on Monday are CiCi Bellis(4), Sonya Kenin(11), Tommy Paul(13), Alex Rybakov, Reilly Opelka as well as Blumberg(9) and Mmoh(6). Dolehide is scheduled for her second round match. Doubles begins on Monday as well, with 14 Americans in the draws, but only three all-American teams: Paul and Blumberg(4), Rybakov and Ponwith, and Dolehide and Stewart(6). Fritz is playing with Luz, and they are the top seeds, with Mmoh and Santillan seeded No. 4. Blanch is partnering Juan Pablo Ficovich of Argentina. Kenin and Swan are the No. 2 seeds, Gordon and Charlotte Robillard-Millette of Canada are No. 4, and Arconada and Nadia Podoroska of Argentina are No. 5. Di Lorenzo and Luisa Stefani of Brazil, who won the Grade 1 Banana Bowl, Grade A Porto Alegre and last week's Grade 1 Astrid Bowl, are not seeded, but are obviously an excellent team on clay. Alexandra Sanford, who lost in the final round of singles qualifying, received entry as an alternate. She is playing with Thaisa Pedretti of Brazil. Opelka, Kingsley and Bellis are not entered in doubles. Monday's schedule is here. The draws are are here. An annual trip to Europe to provide red clay experience for juniors prior to the French Open has been a USTA staple for several years, but it hasn't produced much in the way of ranking points until now. Tommy Paul, who turned 18 earlier this month, won his second Futures tournament of the trip today, after winning in Spain two weeks ago and reaching the semifinals last week. Paul defeated unseeded Lorenzo Sonego of Italy on the 20-year-old's home surface 6-1, 6-4, and now makes his way to the French Open Junior Championships, where he is thankfully not on Sunday's schedule. Ten(correction:11) US juniors are playing their first round matches at Roland Garros Sunday, six of the eight girls and five of the eight boys. Raveena Kingsley has drawn top seed and Italian Open champion Marketa Vondrousova of the Czech Republic, a semifinalist in Paris last year. Katerina Stewart, the No. 3 seed, plays wild card Lucie Wargnier of France, Francesca Di Lorenzo faces Evgeniya Levashova of Russia, Michaela Gordon meets No. 8 seed Katie Swan of Great Britain, No. 7 seed Usue Arconada plays Emilie Francati of Denmark and Caroline Dolehide faces Seone Mendez of Australia. Nathan Ponwith plays qualifier Louis Wessels of Germany, No. 9 seed William Blumberg faces Alexander Bublik of Russia, Ulises Blanch meets Franco Capalbo of Argentina, No. 6 seed Michael Mmoh plays Hubert Hurkacz of Poland and No. 2 seed Taylor Fritz plays wild card Gabriel Decamps of Brazil. I'm not sure why a 15-year-old Brazilian was awarded a wild card, but in the girls draw, 15-year-old Shuyue Ma of China received a wild card, so perhaps the French federation reserves one in each draw for an international junior. The schedule for Sunday's play is available here, the draws are here. At the Grade 1 in Belgium, Mikael Ymer of Sweden won the boys title, beating Marcelo Barrios Vera of Chile 6-2, 6-3. It's the 16-year-old's second Grade 1 title, both on clay. Katharina Hobgarski of Germany, who received a special exemption into the main draw of the French juniors based on her performance this week, won the girls title. The No. 8 seed defeated Elena Rybakina of Russia, the No. 13 seed, 6-1, 4-6, 6-2. 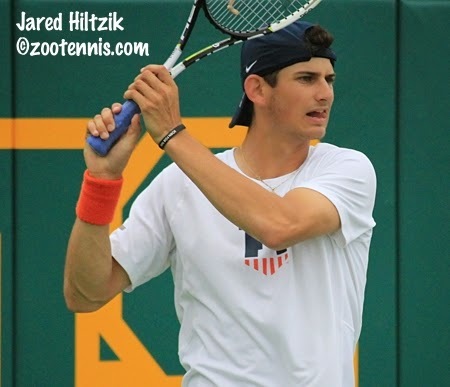 Liam Caruana has reached the final of the ITF Grade 2 this week in Hungary, and will play 2014 Orange Bowl 16s finalist Mattias Siimar of Estonia for the title Sunday. Zeke Clark and Nathan Perrone lost in the quarterfinals. Two US women, Serena Williams and Sloane Stephens, and one US man, Jack Sock, advanced to the second week of the French Open. Williams is a two-champion in Paris and Stephens has now reached the fourth round for the fourth straight year, but this is Sock's first time in the fourth round of any major. 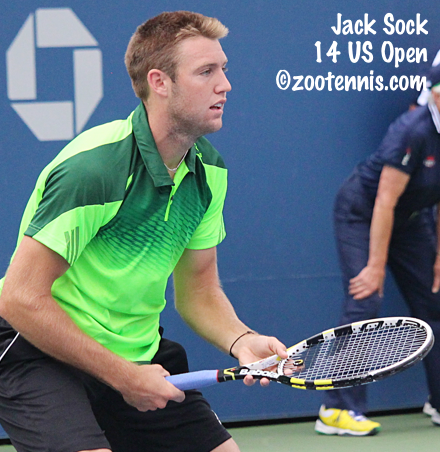 The 2010 and 2011 Kalamazoo champion defeated 18-year-old Borna Coric of Croatia today 6-2, 6-1, 6-4, in a match much less competitive than expected primarily due to Sock's form. On Monday, Sock will play Rafael Nadal for a place in the quarterfinals. Christopher Clarey of the New York Times wrote this feature on Sock, who, with his own surgery and brother Eric's life-threatening illness, had a depressing start to the year. Tommy Paul has had quite a month for himself on the red clay of Europe, winning his first Futures title in Spain earlier this month, making the semifinals in the Futures the following week, and this week reaching the final of a Futures in Italy. The 18-year-old Paul, who is in the main draw of the French Junior Championships based on his ATP ranking, which is now 528 and will rise when the last two weeks' results are added in June, beat No. 2 seed Andres Molteni of Italy 3-6, 7-6(4), 6-2 in today's semifinals. He will need to make a quick trip to Paris after Saturday's final for the French Open Junior Championships, but I assume he receive a Monday start. Paul will play unseeded 20-year-old Italian Lorenzo Sonego in the final. Sonego, who beat top seed Nils Langer of Germany 6-4, 6-2, took a different developmental path. He played only 1 ITF Junior tournament, at the age of 16, losing in the first round of qualifying at a Grade 2 in Italy. At age 18 he played eight Futures in Europe, never getting out of qualifying. Last year, he began to succeed in qualifying, reaching the semis of one Futures and winning a round in the main draw of an Italian Challenger. Tomorrow will be his first Futures final, so Paul, two years younger, will have an edge in experience. Fanny Stollar of Hungary is another junior scheduled to compete in the French Junior Championships next week who is doing well on the ITF Pro Circuit this week. The 16-year-old Stollar will play 15-year-old Georgia Cracium of Romania in Saturday's final of a $10,000 tournament in Romania. At the ITF Grade 1 in Belgium, none of the three Americans who made the quarterfinals in singles progressed beyond that. Francesca Di Lorenzo did take the doubles title however, again teaming with Luisa Stefani of Brazil, who has committed to Pepperdine. Di Lorenzo and Stefani, the top seeds, defeated No. 2 seeds Katharina Hobgarski of Germany and Greet Minnen of Belgium 6-3, 6-4. Hobgarski will face 15-year-old Elena Rybakina of Russia in the singles final. Mikael Ymer of Sweden meets Marcelo Barrios Vera of Chile in the boys singles final. Alejandro Tabilo of Canada and Felipe Cunha Silva of Portugal won the boys doubles title 6=3, 4-6, 10-4 over Youssef Hossam of Egypt and Felipe Meligeni Rodrigues Alves of Brazil. Qualifying is complete for the French Junior Championships, with none of the three US players participating reaching the main draw. Emil Reinberg and Maria Mateas lost in the first round; Alexandra Sanford lost in today's second and final qualifying round. The junior draw will be out some time tomorrow, with play beginning on Sunday. Three years ago, ITF World Junior champion Filip Peliwo of Canada made the final of all four junior slams, winning the last two. He has yet to break through on the ATP tour, however, with his highest ranking 223 last year. Stephanie Myles, the Canadian journalist, provides this update on his current coaching and playing situation. 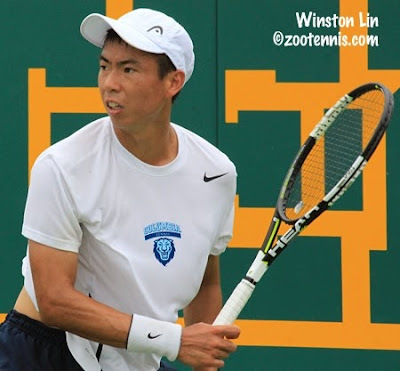 My recap of the NCAA singles and doubles tournaments is available today at the Tennis Recruiting Network, and if you missed it last week, my recap of the team tournament is here. The Raleigh News and Observer published this feature on women's champion Jamie Loeb, and the Charlottesville Daily Progress spoke with Virginia's Ryan Shane about his title. In addition to getting behind on junior news while I was in Waco, I also was short on time to follow the Division II and Division III tournaments. Barry won the men's Division II team title for the second time in three years, beating Hawaii-Pacific 5-3 in the final and finishing the season undefeated. The women's Division II team championship is also the property of an undefeated powerhouse, with Armstrong State defeating Barry 5-2. The Pirates have won six of the last eight Division II women's team titles. In Division III, which has both team and individual tournaments, the Claremont-Mudd-Scripps men's team took the rare Triple Crown, winning the team, singles and doubles titles. Top seed CMS defeated Middlebury 5-0 to win the team title, and Warren Wood defeated teammate Skyler Butts 6-1, 6-4 for the singles title. The Stags also took the doubles championship, with Wood and Joe Dorn beating North Carolina Wesleyan's Robert Kjellberg and Sebastian Sikh 6-3, 6-7(5), 6-4. Top seed Williams won the women's Division III team title, beating No. 2 seed Emory 5-4 for its seventh title in eight years. The Williams team of Linda Shin and Juli Raventos, who were the Ephs No. 2 team during the season and alternates into the doubles tournament won their school's second title, beating the Claremont-Mudd-Scripps team of Katie Kousman and Caroline Ward 7-5, 6-7(4), 6-3. Top seed Eudice Chong of Wesleyan won the singles title, the first NCAA national title for her school, beating Joulia Likhanskaia of Bowdoin 6-4, 4-6, 7-5. Sandra Harwitt is at the French Open and she caught up with Steve Johnson, who plays his third round match against Stan Wawrinka Friday, to talk about his college tennis career. 2014 ITA All-American champion Sebastian Stiefelmeyer of Louisville recently answered questions about his college tennis experience, his future, and why he chose to come to the United States to attend college and continue competing. 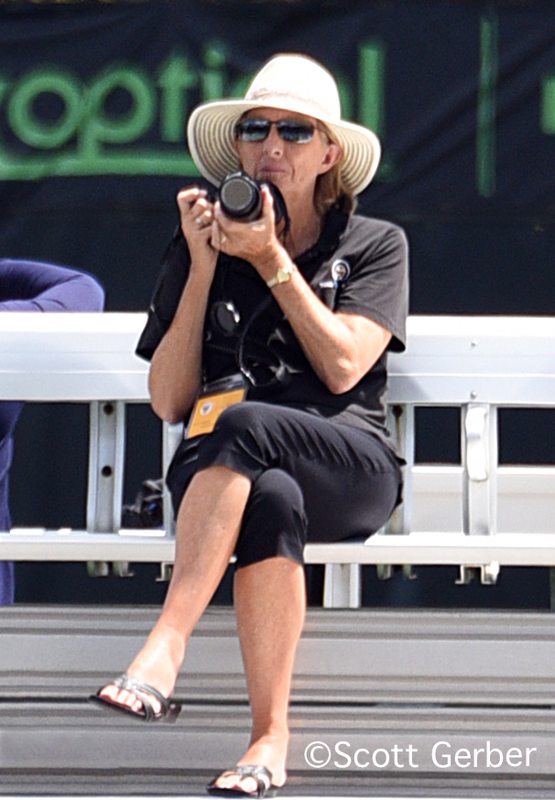 This interview, at Smartathlete.com, is important reading for anyone looking for an honest account of a player's college tennis experience, whether you're a fan, coach, player, parent or journalist. The qualifying draws came out today for the French Open Junior Championships and available at the ITF junior website. As is frequently the case, the French Open is the most difficult of the junior slams to get into, as evidenced by the cutoffs, which are determined when the qualifying draws are made. The ITF junior ranking main draw cutoff this year for boys was 47, for the girls it was 53. To get into qualifying, a player needed an ITF world ranking of 77, the last girl to get into this year's French qualifying was ranked 106 at the time of acceptances. Three Americans are in qualifying: Emil Reinberg, who plays No. 3 seed Jake Delaney of Australia in the opening round, Maria Mateas, who moved into qualifying from the alternate list, and Alexandra Sanford, the No. 13 seed. Since I posted the acceptances earlier this month, both Claire Liu, who had an injury that kept her from competing at the ITF World Junior Qualifying earlier this month, and Ingrid Neel, who was unsure as to whether she was going to play the French when I spoke to her in April, have withdrawn. I don't have access to the main draw wild cards, but from what I can determine, both Tim Sandkaulen of Germany and Felipe Cunha Silva of Portugal have received special exemptions due to reaching the quarterfinals at the Grade 1 in Belgium this week. One girls special exemption appears to have gone to Valeryia Zeleva of Russia; Katharina Hobgarski of Germany is also in the quarterfinals of Belgium, but she was the next player into the main draw anyway, so she will probably not be listed as an SE in the draw. Speaking of the Grade 1 Astrid Bowl in Belgium, three US juniors are still alive: No. 9 seed Nathan Ponwith, who beat No. 8 seed Alejandro Tabilo of Canada for the second time in two months, taking a 3-6, 6-2, 6-2 decision; Vasil Kirkov, who defeated No. 7 seed Denis Klok of Russia 6-7(8), 6-3, 6-2; and No. 5 seed Francesca Di Lorenzo, who beat Ulyana Grib of Belarus 6-1, 6-1. Di Lorenzo and partner Luisa Stefani of Brazil, the top seeds, are into the doubles semifinals. Tommy Paul and Michael Mmoh, both of whom are in the boys main draw at Roland Garros, are warming up in Futures events, where they've reached the quarterfinals. Paul, who made the semifinals of the $10,000 Futures in Spain last week, is in Italy this week. Alex Rybakov, who is also in the boys main draw at the French Open, also reached the semifinals in Spain. He lost in the second round in Italy this week. Mmoh is playing a $15,000 Futures in Romania, and he reached the quarterfinals with a 6-4, 4-6, 6-3 win over top seed Hans Podlipnik-Castillo of Chile. 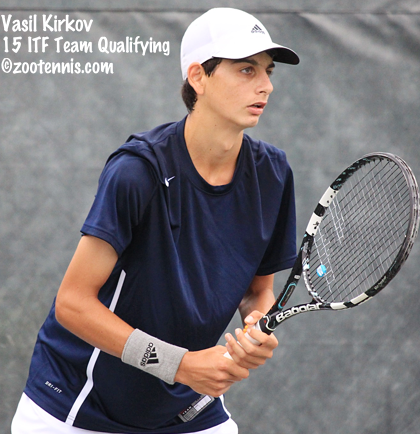 Mmoh will play 2013 Eddie Herr champion and 2014 Youth Olympic Games gold medalist Kamil Majchrzak of Poland. The Wimbledon Junior Championships acceptance list is out, with seven US boys and nine US girls receiving entry into the main draw. Taylor Fritz, Michael Mmoh, William Blumberg, Nathan Ponwith, Reilly Opelka, Ulises Blanch and Tommy Paul are the boys. As with the French, Paul received entry based not on his junior ranking, but on his ATP ranking which is well inside the 750 bar set for main draw. Three other boys, the same three who received entry at Roland Garros, are in on their ATP rankings: Viktor Durasovic of Norway, Juan Pablo Ficovich of Argentina and Theo Fournerie of France. Emil Reinberg and Sam Riffice are in qualifying, with Rybakov the fifth alternate. The US girls with direct main draw entry are: Usue Arconada, Sonya Kenin, Michaela Gordon, Raveena Kingsley, Francesca DiLorenzo, Caroline Dolehide, Ingrid Neel, CiCi Bellis and Claire Liu. Katerina Stewart withdrew. US girls accepted into qualifying are Kayla Day, Alexandra Sanford and Tornado Alicia Black, who received entry based on her WTA ranking of 417. Fiona Ferro of France is the only girl accepted into the main draw based on her WTA ranking, which must be inside 400. Notably absent from the Wimbledon acceptances is current world No. 1 Orlando Luz, who is playing the juniors in Paris. Four other ITF junior Top 25 boys are not entered: Andrey Rublev(2), Stefan Kozlov(5), Mikael Ymer(14) and Roman Safiullin(23). Twenty of the current Top 25 are in the girls draw, with only Iryna Shymanovich(4), Gabby Ruse(8), Jelena Ostapenko(14), Anhelina Kalinina(21) and Kristina Schmiedlova(23). It's been a long day of travel, and I hope to get to bed early, so I can get on French Open time, but I've got a lot of catching up to do on what went on in junior tennis while I was covering the NCAAs for 12 days. The ITF Grade A Trofeo Bonfiglio in Milan finished on Sunday, with Brazil's Orlando Luz and Marketa Vondrousova of the Czech Republic winning the singles titles, and Vondrousova also claiming the doubles championship. With those results, Luz and Vondrousova have moved into the No. 1 position in the ITF junior rankings. The top-seeded Luz was in a race with No. 2 seed Taylor Fritz for the ITF No. 1 ranking last week, but the second-seeded American lost to No. 5 seed Corentin Denolly of France in the semifinals and that was enough to vault Luz ahead of him. In the final, Luz beat Denolly 6-4, 6-7(2), 7-6(3), and the 17-year-old Brazilian is now a clear favorite for the boys title at the French Open Junior Championships, which begin Sunday. In addition to Fritz's semifinal, other US juniors with good results in Milan include William Blumberg and Nathan Ponwith, who reached the quarterfinals. Michal Dembek of Poland and Patrik Niklas-Salminen of Finland won the boys doubles title, defeating Marcelo Barrios Vera of Chile and Juan Jose Rosas of Peru 4-6, 6-1, 11-9. No. 2 seed Vondrousova, who turns 16 next month, defeated No. 7 seed Charlotte Robillard-Millette of Canada 6-2, 6-2 in the singles final. and didn't lose more than four games in any set in her six victories. She teamed with Miriam Kolodziejova, also of the Czech Republic, to win the girls doubles title, with the No. 2 seeds defeating top seeds Dalma Galfi of Hungary and Katie Swan of Great Britain 3-6, 6-2, 10-2. This week's warmup tournament for the French is the Grade 1 Astrid Bowl in Belgium, with both Luz and Robilllard-Millette withdrawing. Sam Riffice moved into the top spot in the draw, replacing Luz, and he has advanced to the third round, as have US boys Vasil Kirkov, Nathan Ponwith(9) and Ulisses Blanch(6). US girls into the third round are Francesca Di Lorenzo(5) and 15-year-old qualifier Nada Dimovska. Two weekends ago, Chase Colton and 13-year-old Whitney Osuigwe won the ITF Grade 4 singles titles in Plantation. The ninth-seeded Colton defeated No. 5 seed Patrick Kypson 6-2, 6-4, while wild card Osuigwe, only eligible to begin ITF play after her 13th birthday last month, defeated No. 9 seed Carson Branstine 6-2, 3-6, 6-4. Osuigwe is now 9-1 in her ITF junior career, which includes just two tournaments. Kypson and John McNally won the doubles in Plantation, with the No. 6 seeds beating unseeded Juan Martin Ramirez Mejia of Colombia and Marcelo Arturo Rodriguez Mojica of Panama 6-0, 4-6, 10-3. The girls doubles title in Plantation went to No. 5 seeds Victoria Emma and River Hart of Canada. They defeated No. 7 seeds Branstine and Taylor Johnson 2-6, 6-3, 10-5. Last week's Grade 4 in Sweden produced an American champion with Sangeet Sridhar, the No. 3 seed, taking the singles title with a 6-1, 6-1 decision over Kristofer Siimar of Estonia, the No. 4 seed. Sridhar also reached the doubles final. The teenaged winners of the USTA's French Open reciprocal wild cards, Frances Tiafoe and Louisa Chirico, fell in their opening round matches in Paris over the weekend. Chirico lost to No. 9 seed Ekaterina Makarova of Russia 6-4, 6-2, and Tiafoe lost to Slovakia's Martin Klizan 6-2, 6-1, 6-4. For more on Tiafoe's loss, see this USA Today article. Sandra Harwitt spoke with Chirico in Paris for this Tennis Shorts article. An NCAA singles title can't help but be memorable. But should North Carolina's Jamie Loeb and Virginia's Ryan Shane need any reminders of their accomplishments Monday, the next emergency evacuation warning they hear should suffice. Moments after Shane defeated Noah Rubin of Wake Forest 3-6, 7-6(4), 6-2 and Loeb had closed out Carol Zhao of Stanford 6-2, 4-6, 6-1, the Hawkins Indoor Tennis Center was evacuated due to a tornado warning. The trophy presentations were put on hold and fans, players, coaches and officials were sent, amidst a heavy thunderstorm, to the Baylor basketball facility across the street. That was the second move of the day, after the two singles finals had begun outdoors at the Hurd Tennis Center. Rubin was in complete control of the first set, leading 5-2 after going up 5-0, and Loeb had already secured the first set 6-2, when what was an occasional sprinkle turned into a steady rain. The decision was made to move indoors, and less than 45 minutes later both matches resumed, but the break may have come at an opportune time for Zhao and Shane. "Jamie loves playing outside," said North Carolina coach Brian Kalbas. "She likes to work the elements to her advantage, so outside you could tell that she was in a good rhythm, in a good flow. When it went indoors, I was hopeful, because she was striking the ball so well and moving so well, that it would continue, but you could see that it was Carol who was more comfortable indoors initially." "I think it was good for me," said the second-seeded Zhao, a sophomore from Richmond Hill, Canada. "She came out really hot in the first set and was really aggressive. It was nice to have the time to regroup and change the game plan a little bit and once we got indoors, I was able to settle down a bit more." Loeb had a chance to post a rare straight-set victory in this tournament, with four of her five previous wins taking three sets, when she broke Zhao in a long, well-played game to go up 4-3 in the second set, but Loeb followed that break with her worst game of the match, making three unforced errors to give the break right back. "Obviously I knew the finish line was near and I think I rushed it a little bit," Loeb said of that eighth game. Zhao played the final three games of the set flawlessly, holding in a four-deuce game in which she saved two break points, then broke for the set, with Loeb double faulting on set point. If Loeb was discouraged by her performance in the final three games of the second set, she didn't show it. Three straight breaks opened the third set, and in the third of those, Zhao had the misfortune of a line judge being called for a hindrance, by making an audible sound but signaling the ball was good. The point 15-30 point had to be replayed, although Zhao would have won it without the hindrance, and she lost the replayed point, and the next one. Loeb held, then broke again, not making the same mistake in the third set she had made in the second. "I started pressing at times in the second set," said Loeb, a sophomore from Ossining, New York. "In the first set, I was definitely in control of a lot of the points, but moving indoors, she stepped up her game a little bit and I started forcing some shots. But in the third set, I kind of went back to that same mentality, same game plan and I think I executed really well the last set." The US Open wild card traditionally awarded an American winner of the NCAA singles title is especially precious for Loeb. "I've always dreamed of playing in the US Open," said the 20-year-old Loeb, the first NCAA singles champion in North Carolina history. "I'm from New York, I live like 30 minutes away from the National Tennis Center. I've played in qualies one time, but playing main draw, it's just an amazing feeling. I think it also takes the pressure off this summer in my upcoming tournaments, so it's definitely a great feeling." Shane admitted thoughts of his US Open wild card surfaced late in his third set against Rubin. "It crept into my mind at 5-1, 30-0 when I played the tightest point of the match, squeaked a backhand over the net, then shanking a forehand," said the 21-year-old from Falls Church, Virginia. "But I'm very excited. It's an opportunity I've been looking forward to, basically ever since I got to college. You're always thinking, NCAAs, the US Open is in the equation. Now that I've got it, I'm excited and I'm going to work as hard as I can this summer to prepare for it." Shane looked to be a long shot for that wild card with Rubin just two points from victory with Shane serving at 3-5, 30-all in the second set. Shane held, forcing Rubin to serve it out, which he was unable to do. A rare double fault at 15-30 gave Shane two break points and he converted the second with an absolute laser of a forehand winner. "When I was down 5-4, I really didn't think I was done," said Shane, the No. 8 seed in the tournament. "I thought if I could get every return in the court and look for forehands I could break. I think I made every return and hit mainly forehands and it paid off that game. I just focused on that for the rest of the match and it paid off very well." Rubin was disappointed that he failed to close out the match when he had the opportunity. "He hits one of the biggest balls in the world, probably, but it shouldn't have come to that," said Rubin, the No. 7 seed, who had beaten Shane last month in the final of the ACC Tournament final. "I had my opportunity, a set and 5-4. He only did it for a set, but it was all he needed to do. When you're hitting it that big, that many times from that many spots on the court, there's really not much I could do. I can't be upset at that, but that I didn't serve it out at 5-4." Shane said going indoors was not so much about the surface change, but the 45 minutes he had before play resumed. "Indoors definitely helps me a lot, but I think it was just the break I got," said Shane. "Whether we went back outdoors or indoors, I just needed to gather myself. I was scattered a little bit after going down 5-0. To be able to go inside, sit down, relax, think about what I would have to do, seeing what he was doing. Indoors definitely helped, but I think that break in general helped me a lot too." The tiebreaker Shane won to send the match to a third set was indicative of just how little Rubin, with all his speed and defense, could do when Shane was playing his best. He hit four forehand winners and a good first serve, with Rubin scrambling just to get a racquet on the ball. 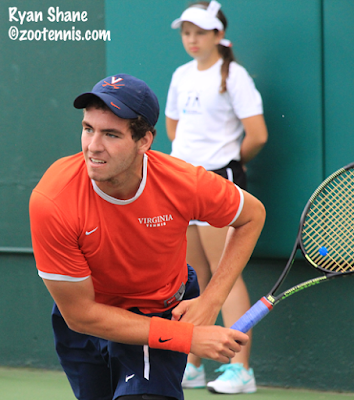 "He just started executing better," Virginia coach Brian Boland said of Shane's performance in the tiebreaker and final set. "Give credit to Noah. He put himself in a position to win and it's nothing that he didn't do right. It was more about how Ryan came up with some big shots when it mattered the most." Shane gave volunteer assistant coach Scott Brown credit for keeping him focused as he approached the tiebreaker. "He told me, third gear, and you'll get your opportunities, and when it worked in the tiebreak, I thought maybe I'll do this for the third set too," said Shane. "It worked very well. Scott's been on my court all NCAAs. He's a great coach. He kind of helps me balance myself out if I ever get too negative or too rushed. After I went down 5-0, he said you'll get your chances, just relax. I got my chances, and relaxed, and he was right." Shane couldn't recall ever holding a post-match press conference in a tornado shelter, but as the deluge continued outside, he was too happy to care about his surroundings. "I've never had a situation even similar to this," said Shane. "But I don't mind it. I'll stay down hours if I have to. A win is a win, no matter where I celebrate it." With no break in the storms in sight, the doubles finals were played indoors after the all clear had been given. Texas and Texas Tech fans, who had come early for the men's doubles final, stuck around to offer vocal support to their respective teams. 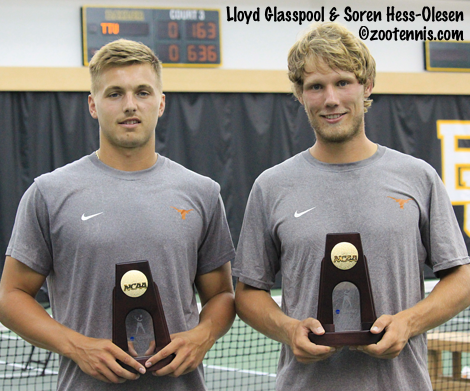 It was the Longhorns who went sloshing home happy, with seniors Soren Hess-Olesen and Lloyd Glasspool defeating Hugo Dojas and Felipe Soares 6-1, 3-6, 6-3. Dojas and Soares had not dropped a set, or even lost their serve, in their first four victories, but Texas ended that streak quickly, taking a 2-0 lead in the first set and cruising through the set. Dojas and Soares went up 3-0 in the second set and made their one break stand up to even the match. In the third set, Glasspool and Hess-Olesen got the first break to take a 4-2 lead, but Hess-Olesen immediately gave it back. "We were in their service games a lot, so I knew if I just trusted my game--there was one game in the whole match I didn't trust my game and that was at 4-2--if I hit the ball, and feel like I want to dominate, we're going to break them again," Hess-Olesen said. They proceeded to do just that for a 5-3 lead, and Glasspool served out the match at love, giving Texas its sixth NCAA championship doubles team, but first since 1944. "This was our last college match ever, so there's no reason to hold back, said Hess-Olesen. "Of course we're proud of making history, proud of our coaches. They got us through today and I don't even know how to describe the feeling right now, but it's huge." Although they were unseeded, Glasspool and Hess-Olesen never doubted they could contend for the title. "We really haven't lost much, honestly," said Glasspool. "We just clicked straight away and we knew we could do it. We were ranked two in the country at one point last year, so we were hopeful coming into this tournament." Glasspool, from England, and Hess-Olesen, from Denmark, who joined in a fan-led version of "The Eyes of Texas" after the trophy ceremony, hope to play together at tournaments on the ITF Pro Circuit this summer. 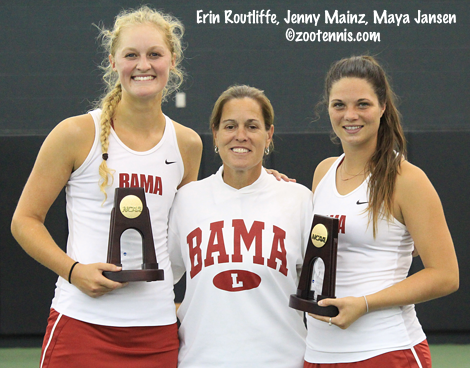 The women's doubles champions are the same as they were last year in Athens: Maya Jansen and Erin Routliffe of Alabama. Jansen and Routliffe, the No. 1 seeds, defeated Cal's Klara Fabikova and Zsofi Susanyi 6-2, 6-7(5), 6-3 in the final. After dropping the first set in their past three matches, Routliffe and Jansen got off to a good start Monday, only to go down 5-2 in the second set. Cal was unable to serve out the set on three occasions however, dropping serve at 5-2, 5-4 and 6-5, so Alabama still had a chance for an elusive straight-set win if they could get the tiebreaker. Up 5-2, with Routliffe serving, Cal won five straight points, and although they were angry, Jansen said they recovered quickly. "They hit some really good shots," said Jansen, a junior from Washington. "They hit three or four winners, so to have a team do that you just have to give it them and go back to the slate. Erin and I are so close in our relationship, we could honestly look at each other and go, OK, this is new. We were both really frustrated and we let that out and went back to the basics." Jansen and Routliffe took a 3-0 lead in the final set, lost three straight games, then won three straight to add a NCAA second title to the school's record books. "I think this one means even more," said Jansen. "To have that pressure all year, to come into the tournament ranked one, to hold on to your national championship title, it's really a tough feeling and I'm definitely really proud of us for doing that." "There was a lot more pressure going into this tournament with our success last year and being seeded No. 1," said Routliffe, a sophomore from Ontario. "I think we did a really good job of taking each match like the one before, and not treating any opponent differently, sticking to our strengths instead of playing to our opponents' weaknesses." Two New Yorkers playing for Carolina schools, both No. 7 seeds, and both alumni of the John McEnroe Tennis Academy, will play for NCAA singles titles Monday at the Hurd Tennis Center on the Baylor University campus. 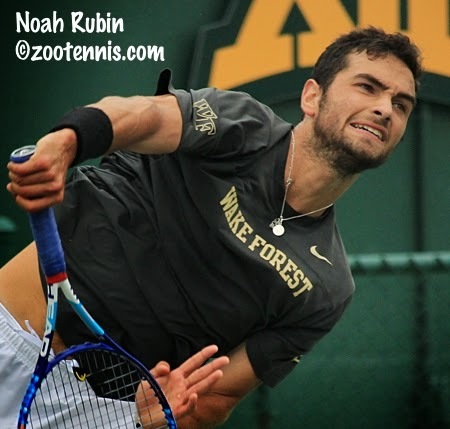 Noah Rubin, a freshman from Wake Forest, will play No. 8 seed Ryan Shane, a junior from Virginia, for the men's title, while North Carolina's Jamie Loeb meets No. 2 seed and fellow sophomore Carol Zhao of Stanford for the women's singles championship. Rubin earned his opportunity for a place in American tennis history by defeating unseeded Thai Kwiatkowski, a sophomore from Virginia, 6-4, 6-4 after trailing 3-0 in the second set. Although a few sprinkles and low cloud cover made players and officials jittery in the first hour of play, Rubin was able to keep his focus. "I thought I was very focused throughout," said Rubin, who has won 17 straight matches. "I thought I stepped up when I needed to. I was patient, I knew that my mental game was gonna be important, especially with the possibility of rain." Rubin got the first and only break of the opening set to take a 4-3 lead, then won a long, tough game to stay in front and served it out. Kwiatkowski, much more subdued that he was during his indoor quarterfinal match against Winston Lin of Columbia, got off to a great start in the second set, but Rubin's defensive skills were in peak form. Rubin's lob winner off a Kwiatkowski putaway got the break back and he won the next three games as well. Serving for the final at 5-4, Rubin started with two forehand winners, and a missed return gave him three match points. A good first serve ended it, giving the Wake Forest program it's first NCAA finalist. 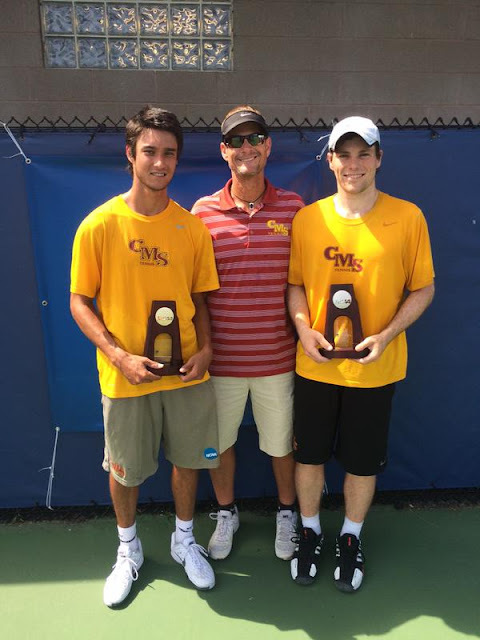 Rubin, the reigning Wimbledon junior and Kalamazoo champion, could become only the second player in history to capture all three titles, joining current UCLA men's coach Billy Martin. Martin however, didn't win the the three in succession, although he did win Wimbledon twice. "You can't get caught up in history," said Rubin, who recalled hearing about Martin's legendary junior career when he won Kalamazoo last August. "You just want to do what you can, prepare yourself each and every day. History, it's great and all, but I just want to make people proud." Shane got off to a slow start in his 6-4, 6-1 victory over Quentin Monaghan of Notre Dame, a No. 9 seed, who had beaten Shane in their previous ACC meeting this spring. The junior from Falls Church, Virginia was broken in the opening game but got it back for 3-3, then broke Monaghan, also a junior, to claim the first set. Shane's power, which Rubin referred to as "monstrous," eventually took its toll on Monaghan, who failed to convert two break points down 4-0 in the second set, and Shane served out the match, hitting two aces in the final game, including on match point. Rubin and Shane have met once before, last month in the final of the ACC Tournament final, with Rubin winning 7-6(5), 6-3. Because both Rubin and Shane are Americans, Monday's final also has a US Open wild card on the line, with a US winner of the NCAAs traditionally receiving a place in the main draw from the USTA. Shane admitted the possibility of playing at the Open was never far from his mind. "Yes, I'm allowing myself to think about it," Shane said. "It's just a jump start to any career. It's an experience I would love to have, to play at the US Open. It's definitely been on my mind this whole tournament. I'm trying to block it out as much as I can, but as much as people may not admit it, everyone's thinking about it." Shane said he is not surprised by his performance this week, with last year's tournament helping build his confidence. "Last year I thought I had a decent chance," the 21-year-old said. "Not to win it, I don't think I was ready, but going down to [champion Marcos] Giron in the second round and being the only one to take a set off him, this year I came in knowing I could do well. Obviously, I'm not going to come in and say I'm going to win the tournament looking at the draw, but I definitely thought I had a chance to do something in the tournament. And I'm doing it. I believe in myself and it's paying off." Rubin, who has already played in the main draw of the US Open after receiving a wild card for winning Kalamazoo, says his performance in the final will have no bearing on his decision as to whether he'll return for his sophomore year. As for another main draw wild card, Rubin wasn't going to stress out about it. "It's another tennis match," said the 19-year-old. "Obviously, there's a lot on the line, but I feel there's always something on the line when I'm playing tennis, whether it's my future or for fun, whatever it is it's something and I'm always enjoying myself, so hopefully it's just another match." While Rubin has played only one three-set match in the tournament, Loeb, his John McEnroe Academy training partner, has played only one two-set match. In Sunday's semifinal against Stephanie Wagner of Miami, a No. 9 seed, Loeb again went the distance before posting a 4-6, 6-4, 6-2 victory. "I guess my body's adjusted to that," said Loeb, who needed nearly three hours to eliminate Wagner. "Obviously I want to win in two sets, but maybe the one match I did win in two sets, against the Clemson girl, that was maybe a fluke. These courts are really slow, everyone here is good and they're here for a reason." After only three breaks of serve in the opening set, the second set had seven, and although Loeb failed to serve out the set at 5-3, she broke Wagner, whom she had beaten twice this season, to claim the second set. In the third set, Loeb took a 3-0 lead, but despite leading 40-0 serving at 3-1, she lost the game. But Wagner, who hits big, appeared to be tiring with Loeb breaking and holding for a 5-2 lead. In the final game, Wagner made errors early in the rallies, which she hadn't done in the first half of the match, and hit a backhand long at 30-40 to send Loeb to the championship match. 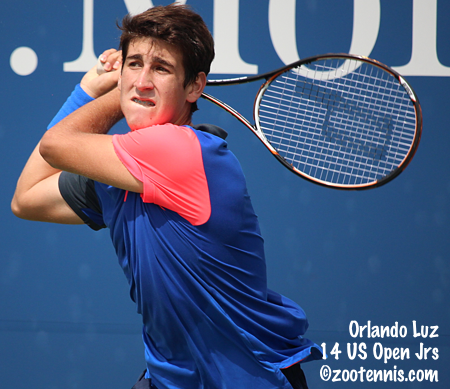 Loeb, a 20-year-old from Ossining, New York, won the American Collegiate Invitational last year at the US Open, earning US Open qualifying wild card for this year. That, she said, has helped her approach this tournament with less stress. "I think last year at this time I put a lot of pressure on myself," said Loeb, who lost in the quarterfinals to Lynn Chi of Cal. "I really wanted it, and also being top seed and having a lot of success, I put a lot of pressure on myself. This year, I guess I'm the underdog, which is new, but in a way I kind of like that. I secured the qualies wild card, which I think took a little pressure off, gave me an opportunity to just play and not just focusing on winning." Stanford's Zhao, who is from Canada and therefore is not in the running for a US Open wild card on Monday, dropped her first set of the tournament against Florida's Josie Kuhlman, a No. 9 seed, but recovered for a 2-6, 6-4, 6-0 victory. Zhao, who played doubles until nearly 9:30 p.m. indoors on Saturday night, said she needed time to adjust to the conditions. "I was a little bit sluggish from the start," said Zhao. "I wasn't used to the outdoor feel, so it took me a few games to adjust. I warmed up indoors, because I thought the match would be indoors because of rain. But Josie came out playing really well and had a good game plan and I wasn't able to execute in the beginning." Zhao went up a break twice in the second set, but was immediately broken back, until she broke for a 5-4 lead. She served out the set and won nine straight games to take the match, but Kuhlman never wavered in her effort. In the third game of the third set, Kuhlman served trailing 2-0 but Zhao won the six-deuce marathon game and took control from there. "Those are the games were you've got to bear down and try to win, they can be the turning point of the match," said Zhao. "3-0, 2-1, it's a big difference, especially going up two breaks. It gave me a big cushion in the third set, so I was really happy to fight my way through that." Zhao could become Stanford's 15th NCAA singles champion, a legacy she said provides inspiration. "If anything it provides motivation for me to do well for my school and carry on that tradition," Zhao said. "I'm just really happy to be in this position in the final, and hopefully I can take it all the way." The doubles finalists were decided Sunday, with an unseeded Big 12 men's champion now assured. Texas Tech's Hugo Dojas and Felipe Soares defeated Harry Jadun and John Patrick Mulland of Michigan State 6-3, 6-2 to advance to the final, where they'll meet the Texas team of Lloyd Glasspool and Soren Hess-Olesen. Glasspool and Hess-Olesen overcame No. 5 seeds Julian Lenz and Diego Galeano of Baylor 2-6, 6-3, 7-6(3), disappointing the large crowd of local fans. The women's final will feature defending champions and top seeds Erin Routliffe and Maya Jansen of Alabama, who came from a set down for the third consecutive match to beat the unseeded Stanford team of Caroline Doyle and Ellen Tsay 4-6, 7-5, 6-1. Routliffe and Jansen will play No. 5 seeds Klara Fabikova and Zsofi Susanyi of Cal, who came from behind to beat Florida's Brooke Austin and Kourtney Keegan 3-6, 6-4, 6-4. Austin and Keegan were up 4-1 0-40, but Cal held to make it 4-2, then reeled off the last five games of the match. Both singles finals begin at noon on Monday. Although the times for doubles have not been posted, in the past the doubles follows the singles. The live streaming, live scoring and live blog links are at the tournament page. Another rainy day in Waco sent the NCAA Division I singles and doubles quarterfinals indoors, with drama sending the decibel level at Baylor University's Hawkins Indoor Tennis Center to deafening heights. Top seed Robin Anderson of UCLA fell to Stephanie Wagner of Miami, a No. 9 seed, 3-6, 6-4, 6-2, and defending champion Danielle Collins of Virginia, also a No. 9 seed, surrendered her title, losing to No. 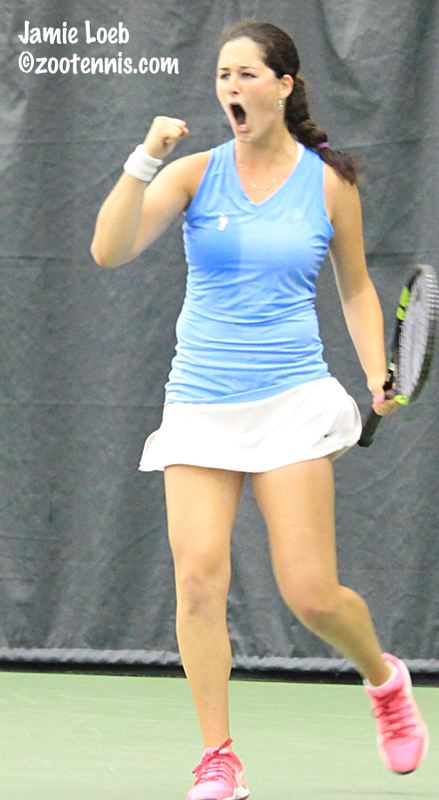 7 seed Jamie Loeb of North Carolina 6-3, 1-6, 6-4. Both Collins and Loeb were hitting with great depth and pace of shot, but service holds were rare. Loeb held for a 3-1 lead in the first set, then five straight breaks gave her the first set. Collins got the only two holds of the second set, using her drop shot effectively to keep Loeb from digging in on her ground strokes. But in the third set, Loeb was the steadier player, taking a 4-0 lead before Collins fought back for 4-3. She would get no closer, as the sophomore from New York protected her remaining break and served out the match. "With the new balls [to start the third set] she was spraying some balls," said Loeb, who said she was comfortable on the indoor courts, having played two of her team matches there. "I think I just went back to the originial game plan, working the point more and just not panicking, playing to my strengths and not so much just to her weaknesses." Loeb admitted she may have lost a bit of focus up 4-0. "At times I looked too far ahead in the game, in the match, but in the end, I just took it one point at a time and tried to maintain that lead," Loeb said. "I'm really excited, after last year's loss in the quarters, in three sets as well. I happy to be here. I think I'm playing pretty well, and I'm looking forward to it." Loeb has beaten Wagner, a junior from Germany, twice this year, including last week, clinching the Tar Heels' 4-1 win in the round of 16 with a 5-7, 6-2, 6-4 victory. The other women's semifinal will feature No. 2 seed Carol Zhao of Stanford against Josie Kuhlman of Florida, a No. 9 seed. Zhao, who had lost only six games in her first three matches was challenged by unseeded Chanelle Van Nguyen of UCLA, with her 6-4, 7-5 victory taking longer to complete than Loeb's three-set win over Collins. Kuhlman, who went on after the first men's match had finished, defeated fellow freshman Sinead Lohan of Miami 6-3, 6-4. Lohan was up 4-2 in the second set, but Kuhlman broke back, held for 4-all, then won a long deuce game to break again, and served out the match, executing a perfect drop shot on match point. "In the first set I was able to stay aggressive, stepping up in the court, pretty much dictating play," said the Ponte Vedra, Florida resident. "In the second set, she started swinging out, she was playing really well. Luckily I just stayed with it, fought hard and got that set back." Kuhlman pointed out the importance of that final break in the ninth game. "I think after that game, she was done," Kuhlman said. "If she would have gotten that game, it might have been a different match, so I knew I really needed to get that game, I was fighting hard." Kuhlman and Zhao have not met since the Eddie Herr 16s in 2010, a match Zhao won 6-3, 6-4. All four men's quarterfinals went to three sets, and when the winners emerged, all four were Americans from the ACC, including two Virginia Cavaliers. The last time all four semifinalists were from the same conference was in 1995, when the last four were Pac-10 competitors. Ryan Shane, seed No. 8, had his hands full with unseeded Felipe Soares of Texas Tech, but reached the semifinals with a 6-7(4), 6-4, 6-3 decision. Soares, a junior from Brazil, serves and volleys frequently, so Shane was required to make some adjustments on his returns and passing shots. "He had a great serve and volley game," said Shane, a junior from Falls Church, Virginia. "I maybe had one break point in the first set, and in the second set I don't think I had any. In the third set, I think I caught on to what he was doing, and I was trying to take away his better serves. If I made my return, I was still expecting a great volley. His volleys were amazing and I couldn't expect to get free points against him, and that helped me in the third set a lot." With Soares serving at 3-4, Shane finally had the luxury of two break points at 15-40, but only needed one. Soares called Shane's putaway shot on the near side out, but was overruled by the chair umpire, and Shane served out the match in the next game. Almost simultaneously, Quentin Monaghan of Notre Dame closed out his match against TCU's Cameron Norrie 4-6, 6-1, 6-3. Monaghan, a No. 9 seed, fell behind 0-30 in the final game, and saved a break point, using his routine to overcome the nerves he was experiencing. "I was just rushing," said the junior from Chatham, New Jersey. "There was a lot on the line and that was probably as nervous as I've felt. I just kind of had to go back to my towel, make sure that I'm taking my time, not getting lost in the moment, but keep going after it." Norrie, a freshman from New Zealand, saved one match point with a blistering forehand pass, but Monaghan converted the second, becoming the first player in program history to reach the NCAA semifinals. Shane and Monaghan met in the ACC regular season, with Monaghan taking a 7-6(4), 6-3 victory. "Conditions were brutal," Monaghan said of that March match in South Bend. "It was windy and like 50 degrees, conditions that probably helped me. I know he's an incredible player and he's been having great results. It'll be tough." No. 7 seed Noah Rubin of Wake Forest advanced to the semifinals, defeating unseeded Jared Hiltzik of Illinois 6-7(7), 6-2, 6-2. Neither player could take advantage of his opportunities late in the 70-minute first set, with Rubin failing to convert on two set points with Hiltzik serving at 4-5, and Hiltzik failing to convert on two break points in the next game. Rubin had two more set points in the tiebreaker, but a netted forehand at 6-5 and a Hiltzik ace at 6-7 erased those, and two unforced errors later, Hiltzik had the first set. After starting the second set with a break, Rubin, the first player from Wake Forest to ever reach the quarterfinals, also took an early lead in the third set. The defense played by both, who are two of the quickest players in college tennis, made outright winners hard to come by, but Rubin began to force errors and he closed out the match with little drama. Rubin's opponent in the semifinals is another Virginia Cavalier, unseeded sophomore Thai Kwiatkowski, who saved two match points in his 6-4, 5-7, 7-5 win over Winston Lin of Columbia. Kwiatkowski was talking loudly to himself throughout the first two sets, remarking several times that he did not want to be there. In the third set, although still agitated by line calls he did not agree with, Kwiatkowski settled down. At 4-all, he saved three break points but not a fourth, with Lin hitting a backhand winner on the run to serve for match. Down 0-30 in that attempt, Lin won the next three points to earn his first match point. After a long rally, Kwiatkowski worked his way into an overhead, which he put away. But a forehand long gave Lin another match point, and again Kwiatkowski played aggressively, with a forehand forcing a Lin error. A wild forehand and double fault followed, making it 5-all. Kwiatkowski saved a break point in the next game with a forehand winner, then slammed an ace for game point. Lin countered with a forehand winner of his own, but it would be the last point the senior from New York would win. He netted a return and hit a lob long to give Kwiatkowski the game, and serving for the match, Lin missed a putaway, double faulted, was passed by Kwiatkowski and then hit a backhand long, broken at love to put Kwiatkowski in the semifinals. In the doubles semifinals, one defending champion survived, but another did not, and the No. 1 seeds also were eliminated. Erin Routliffe and Maya Jansen of Alabama, who won the title last year, defeated Ema Burgic and Blair Shankle of Baylor 4-6, 7-5, 6-1 and will play unseeded Caroline Doyle and Ellen Tsay of Stanford. Doyle and Tsay eliminated No. 4 seeds Beatrice Gumulya and Jessy Rompies of Clemson 4-6, 6-4, 6-4. Cal's Klara Fabikova and Zsofi Susanyi, seeded No. 5, defeated Vanderbilt's Astra Sharma and Ashleigh Antal 6-2, 6-2. They will play Florida's Brooke Austin and Kourtney Keegan, also No. 5 seeds after Austin and Keegan beat No. 2 seeds Zhao and Taylor Davidson 6-0, 1-6, 6-4. Top seeds Austin Smith and Ben Wagland of Georgia were eliminated by the unseeded Texas Tech team of Soares and Hugo Dojas 6-2, 6-3. Soares and Dojas will play Michigan State's Harry Jadun and John Patrick Mullane in the semifinals. The third unseeded men's team in the semifinals is Texas's Lloyd Glasspool and Soren Hess-Olesen, who defeated Arjun Kadhe and Jakob Sude of Oklahoma State 6-4, 6-2. The host team placed a team in the semifinals for the first time in its history, with Baylor's Julian Lenz and Diego Galeano, seeded No. 5, taking out No. 4 seeds and defending champions Mikelis Libietis and Hunter Reese of Tennessee 6-7(5), 6-3, 6-4. The quality and entertainment value of the match was high, with the Baylor fans adding to the atmosphere. In the tense final games, Lenz and Galeano made fewer mistakes and controlled the net to earn their place in the final four. Singles are scheduled to begin at noon CDT on Sunday, followed by doubles. Rain is again in the forecast. For more, see the tournament page. 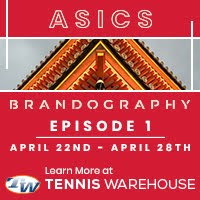 Before the start of today's NCAA Division I singles and doubles quarterfinals, which most likely will be played indoors due to rain, I wanted to post a link to my Tennis Recruiting Network recap of the team championships. Also, below are the All-Tournament teams and the ITA's national award winners. A trio of brief rain delays didn't derail defending champion Danielle Collins of Virginia, who will be joined in the NCAA women's singles quarterfinals by two other 2014 quarterfinalists: Jamie Loeb of North Carolina and Chanelle Van Nguyen of UCLA. Collins, a No. 9 seed, defeated unseeded Jennifer Brady of UCLA 6-1, 7-5, coming from 5-2 down in the second set. Collins had already made up two games of the deficit before an unanticipated shower caused a 10-minute interruption. "I was down 5-4 when it started raining, so a lot of times people think, oh no, this is going to break my momentum," said Collins, a junior from St. Petersburg, Florida. "But I really felt like I could actually use it to break her momentum, with movement and the intensity of my shots and how well I was playing. I took advantage of the break, maintained my focus. Luckily it was smooth sailing from 2-5 down." If any player in the draw was capable of disregarding Brady's WTA ranking of 209, it is Collins, who drew Simona Halep, then No. 2 in the world, as her first round opponent as a US Open wild card, and proceeded to win the first set in a tiebreaker. "I heard somebody say Collins has to play Brady and that's going to be a really good match, she's 200 in the world," said Collins, who has now won 16 matches in a row. "Well, I thought, I took a set off the No. 2 player in the world. I used [the US Open match] as a really good learning experience and a big confidence booster. I've had a lot of matches this season when I've played some really tough girls and have been in situations where I've been down, lost first sets, or been down 5-1 in a second set and I've been able to come back. I just use all of that to give me confidence to know that I can do it." 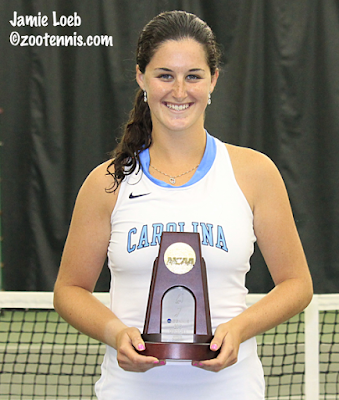 Next up for Collins is 2014 quarterfinalist and seventh seed Loeb, who defeated Joana Eidukonyte of Clemson, a No. 9 seed, 6-3, 6-1 Friday. Loeb and Collins play in the same conference, but because Collins plays No. 2 and Loeb No. 1, they haven't met since last September, when Loeb beat Collins 6-3, 6-1 in the semifinals of the US Open Collegiate Invitational. That is the only all-American match in the quarterfinals. Top seed Robin Anderson of UCLA, who beat Sabrina Santamaria of Southern Cal 6-1, 6-2 Friday, will play No. 9 seed Stephanie Wagner of Miami. Wagner won a tough battle with unseeded Saska Gavrilovska of Texas A&M 6-1, 4-6, 6-4. Wagner's teammate Sinead Lohan, the ACC Rookie of the Year, advanced to play another freshman, Josie Kuhlman of Florida, a No. 9 seed. Lohan defeated unseeded Natalie Beazant of Rice 7-5, 6-1, while Kuhlman recorded a 6-4, 6-1 victory over No. 4 seed Maegan Manasse of Cal. Unseeded Chanelle Van Nguyen of UCLA, a quarterfinalist in 2014, returned to the final eight with a 6-4, 6-1 win over Ema Burgic of Baylor. Van Nguyen will face No. 2 seed Carol Zhao of Stanford, who has lost just six games in three matches. On Friday, Zhao defeated Zsofi Susanyi of Cal 6-2 6-0. In contrast to the six seeds remaining in the women's quarterfinals, only two advanced to the men's final eight: No. 7 seed Noah Rubin of Wake Forest and No. 8 seed Ryan Shane of Virginia. Rubin defeated Yannick Hanfmann of Southern Cal, a No. 9 seed, 6-2, 6-4, although he saw his chance for a simple win slip away in the third game of the second set. Already down 2-0, Hanfmann saved four break points, went on to break Rubin in the next game and held for a 3-2 lead. Serving at 3-4, Rubin saved two break points, held and broke to find himself up 5-4. "A couple of rain delays, fought a couple points and it switched in the blink of a moment," said the freshman from New York. "I scraped a couple of balls down, he got a little upset, then the last game wasn't even a game." After missing a forehand at 30-40, Hanfmann slammed a ball back and the fence and it ricocheted back to Rubin's side of the court. Hanfmann was given a point penalty for ball abuse, so Rubin was up 15-0 when the game started. "I hate saying this, but he tanked a couple points and that was it," Rubin said of the end of the match. "He's a great player, and I'm happy to be here. He's had good results--at Indian Wells beating Mathieu--he's beat some top 100 players so it was a good match." Rubin will play Jared Hiltzik of Illinois, who defeated Lloyd Glasspool of Texas 7-6(3), 2-6, 6-3. Hiltzik said the rain delays, the second of which lasted more than half an hour, complicated the process, but didn't ultimately hurt him. "After the first rain delay I regrouped a lot, started to figure things out and played a lot better towards the end of that second set," said the junior from Wilmette, Illinois. In the third set, Hiltzik got the break for a 4-2 lead, held for 5-2, and was up 40-0 serving for the match. But a backhand error, a double fault and a forehand winner by Glasspool and all three match points had evaporated. A good first serve gave Hiltzik his fourth match point, and after a long rally, he converted with an inside out backhand winner. "In the 8s, 10s, 12s, the down the line backhand was my best shot," Hiltzik said. "I'm coming around to being a more complete player now, but I'll always have that shot." 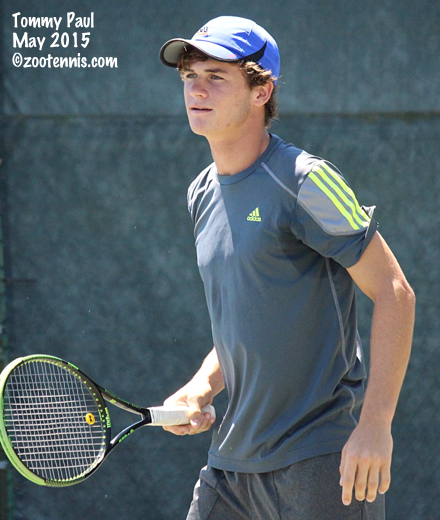 Hiltzik and Rubin last played in the quarterfinals of the 2012 Easter Bowl ITF, with Rubin winning 7-5, 6-4. In the other quarterfinal in the top half, Thai Kwiatkowski of Virginia will play Winston Lin of Columbia. Kwiatkowski avenged his National Team Indoor loss to Tony Lupieri of Baylor 6-1, 6-1, while Lin defeated the highest remaining seed in the draw, No. 5 Sebastian Stiefelmeyer of Louisville, 7-5, 6-4. Lin trailed 4-1 in the first set, but won four straight games, only to be broken serving for the set. He broke right back, and took his second opportunity to secure the opening set. In the second set, up a break at 3-2, Lin was able to hold on to it, hitting three forehand winners in the final game, the last to close out the match. "I was feeling it physically," said Lin, relieved he could close it out when he did. "The first set was probably the longest I've played this year and one of the toughest physically. I stepped in, tried to take a little time away from him and that helped me a lot. Otherwise, he doesn't miss, so the only way to win points was to actually win them. He didn't give me anything, so that was tough." Lin, a senior who also earned All-American honors last year, missed his graduation ceremony, which was the day of the first round of the team competition, but said it was for "a good reason." After he plays his final match for Columbia, Lin is planning to compete professionally, which is not always the career path for an Ivy graduate. "I'm going to play after college, for a couple of years," said the Williamsville, New York resident. "It's been my goal for a while, so I've got to try it out. I've got a lot of tennis left, but now I just want to keep representing Columbia." The two international players are both on the bottom half, and both play Americans on Saturday. TCU freshman Cameron Norrie of New Zealand defeated No. 9 seed Mikelis Libietis of Tennessee 4-6, 6-4, 6-4 to advance to a contest against Quentin Monaghan of Notre Dame, also a No. 9 seed. Monaghan served for the match against unseeded Jakob Sude of Oklahoma State at 6-2, 5-2, but was unable to get to match point. In his second attempt at 5-4, the junior from New Jersey went up 40-15, but a wild double fault--the second serve landing in the opposite serving box-- cost him the first one and an unforced forehand error the second. But on his third match point, Monaghan hit a great serve down the T to post a 6-2, 6-4 victory. Shane defeated unseeded Jeremy Efferding of Texas A&M in a rematch of their meeting in the team quarterfinals, which went unfinished. Shane managed a break at 4-4 in both sets, the only two of the match, for a 6-4, 6-4 victory. His opponent in the quarterfinals will be unseeded Felipe Soares of Texas Tech, who defeated Jonny Wang of Southern California 6-3, 3-6, 6-2. Soares, a junior from Brazil, is the first player in the program's history to reach the final eight. In doubles, both defending champions advanced to the quarterfinals, with Alabama's Erin Routliffe and Maya Jansen, seeded No. 1, surviving a stern test from Anderson and Brady of UCLA 2-6,6-1, 6-4. Libietis and Hunter Reese of Tennessee, the No. 4 seeds, defeated Denver's Henry Craig and Alex Gasson 6-4, 7-6(2). Men's top seeds Austin Smith and Ben Wagland advanced with a 6-2, 6-3 victory over Tomislav Gregurovic and Tin Ostojic of Wichita State. Six of the eight women's second round doubles matches went to three sets Friday afternoon. Three of the men's doubles matches went to three sets, and the winners of those matches all lost the first set. All unseeded teams who reached the quarterfinals are awarded All-American honors, with seeded teams already achieving that status. Singles begin on Saturday at noon CDT, with six of the eight matches scheduled. The first doubles match is set for 2 p.m.
Live scoring, draws and links to live streaming can be found at the tournament page. The weather changed dramatically Thursday, but the exodus of men's seeds continued with No. 1 Axel Alvarez of Oklahoma and No. 2 Julian Lenz of Baylor joining 10 others on the sidelines. Temperatures reached the upper 80s for Wednesday's first round, with high humidity adding to the discomfort but Thursday's highs were in the mid 60s, with a chilly breeze. Blankets and down jackets, unthinkable 24 hours earlier, were welcome accessories for shivering fans and coaches, although the players appreciated the break from the oppressive heat. Alvarez, who saved two match points in his 3-6, 7-6(3), 6-1 win over Nik Scholtz, could not summon the same magic against Baylor's Tony Lupieri, falling to the 35th-ranked Bear 6-4, 6-4. "I was trying to be relaxed out there, swing fast, and everything works today perfectly for me, a big win for me. It's the second time of the year I've beaten the No. 1 guy in the country," said Lupieri, who beat Virginia's Thai Kwiatkowski when he was ranked No. 1, at the ITA Team Indoor. Lupieri, as with all unseeded players who reached the third round, earned All-American honors with the win, which was less a goal than a bonus. "I didn't put pressure on at the beginning of the year that I wanted to be All-American," said the senior from Croatia. "But it's a great feeling, and it's always great to put on a resume that you're All-American. It's fantastic. I'll come out tomorrow with the same energy and try to win this tournament, that's my goal." 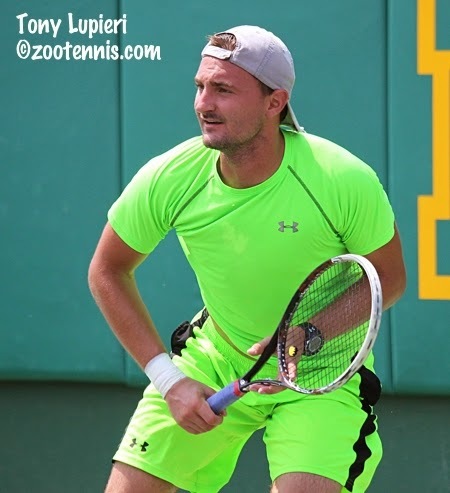 Lupieri's teammate Julian Lenz, ranked No. 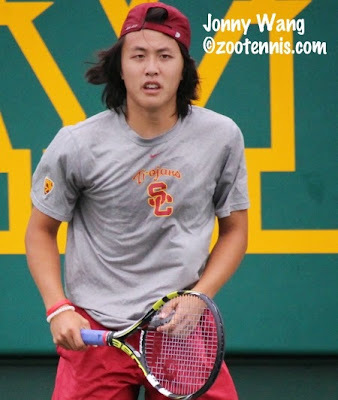 2, can no longer aspire to that, after falling to Southern California's Jonny Wang 6-2, 1-6, 7-5. Lenz had two match points with Wang serving at 3-5, but Wang's serve saved him, with an ace on the first and a service winner on second. He held for 5-4, saved a break point to hold for 5-all, then broke Lenz at love. On his first opportunity to close the match, he converted, and the senior could look ahead to at least one more college match. "I was thinking, wow, this could be my last point, my last match in college tennis," said Wang, who hits a two-handed forehand. "So I was getting a little emotional. I was thinking about all the times I had in college, reflecting on the good times. But I'm just thankful I have another opportunity to play another match." Wang, who walked on at USC, didn't crack the lineup regularly until this year. "It took a lot of time," said Wang, of San Marino, California. "I gave it my all every day, especially in practices. It wasn't so much technically, but the mental aspect that improved. Fighting for every point, staying mentally engaged." In addition to Lupieri and Wang, eight other men earned All-American honors: Kwiatkowski, Jeremy Efferding of Texas A&M, Lloyd Glasspool of Texas, Felipe Soares of Texas Tech, Cameron Norrie of TCU, Jakob Sude of Oklahoma State, Winston Lin of Columbia and Jared Hiltzik of Illinois. Women's top seeds Robin Anderson of UCLA and Carol Zhao of Stanford moved on Thursday with straight-set wins, while No. 9 seed Danielle Collins of Virginia outlasted Ronit Yurovsky of Michigan 4-6, 6-0, 6-3. Collins' next opponent in defense of her title is UCLA's Jennifer Brady, who defeated Jasmine Lee of Mississippi State 6-1, 2-6, 6-3. A third Bruin reached the final 16, with Chanelle Van Nguyen taking out No. 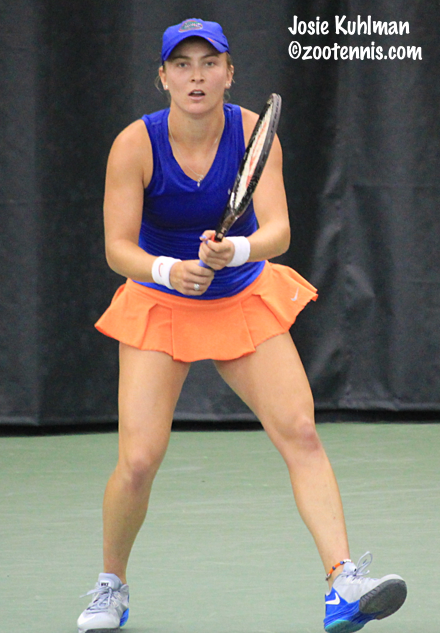 6 seed Julia Elbaba of Virginia 6-2, 6-0, winning 12 straight games from the 2014 National Indoor champion. In addition to Brady and Van Nguyen, six other players have joined the list of 2015 All-Americans: Sinead Lohan of Miami, Natalie Beazant of Rice, Saska Gavriloska of Texas A&M, Ema Burgic of Baylor, Zsofi Susanyi of Cal and Sabrina Santamaria of Southern California. 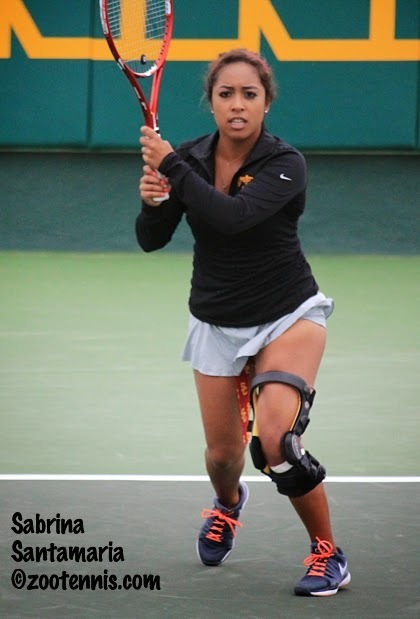 Santamaria, who defeated Belinda Woolcock of Florida 6-3, 6-3 Thursday, still wears a knee brace over a year after tearing her ACL. "I did a lot of bad stuff to my knee last year," said Santamaria, the 2013 NCAA doubles champion. "But I hit the rehab pretty hard and aggressive right after that and I was able to come back after ten months." Santamaria began her return at the No. 6 spot, but by April she was back in the No. 1 spot she had occupied before the injury. "Here, I think I've just been progressing my game," Santamaria said. "I'm still trying to get better each day. I may not be where I was my sophomore year, which was really good, but it's getting there." Her next match is against Pac-12 rival Anderson, who beat Santamaria 3-6, 6-0, 7-5 in USC's 4-3 win over the Bruins on April 16. "It was a tough three-set battle," Santamaria said. "I know she's going to be hungry to beat me and I'm just going to go out and have fun, savor each college match that I have." Despite the rivalry between USC and UCLA on the court, the teams are unusually friendly off the court. "We actually had breakfast this morning together," Santamaria said of Anderson. "We were talking like, man, is it really over? It went by so quickly. Our team and UCLA, even though we're rivals, everyone is really good people; we're friends and on the court, it's good competing. Everyone's cool and really friendly, so it's great." The first round of doubles was completed today, with both defending champions posting wins. Alabama's Maya Jansen and Erin Routliffe, 2014 champions and the top seeds this year, defeated Angeles de los Rios and Elizabeth Thomas of Texas-Arlington, 6-2, 6-1. Tennessee's Mikelis Libietis and Hunter Reese, the 2014 champions seeded No. 4, beat TCU's Nick Chappell and Will Stein 7-6(2), 6-2. No. 2 seeds Yannick Hanfmann and Roberto Quiroz of Southern Cal fell to Lloyd Glasspool and Søren Hess-Olesen of Texas 6-3, 1-6, 6-2 and No. 3 seeds Ryan Shane and Luca Corinteli of Virginia lost to Michigan State's Harry Jadun and John Patrick Mullane 6-1, 6-7(4), 7-5. Top seeds Ben Wagland and Austin Smith of Georgia did advance to Friday's second round. For complete results, see the tournament page.